This burger is inspired by one of my favorite Indy restaurants - Petit Chou. If you're ever in Indy, you definitely need to stop by Petit Chou or Cafe Patachou. It has awesome French food, and won't disappoint. Anyway, they have a burger with Brie and house aioli, and John suggested I try to recreate it. While I wouldn't say it tastes exactly the same, it came pretty close and was nice for an at-home dinner. This is a meal that is sure to please any man in your life. John "mmm'd" the entire time he ate this burger. He continued to call it "savory" throughout the meal, and he loved it so much that he even made the aioli the next day when he reheated the last burger. I love my hubby, but he doesn't cook. So if he loves it so much that he's willing to make it, trust me when I say it's easy and that good. While you are welcome to use any type of bun, I highly, highly suggest using brioche buns. They are such a perfect compliment to the brie and onions. Simply toast them under the broiler for a minute or two and you will be so glad that you went this route. *Preheat a grill or grill pan. Mold meat into patties. Sprinkle with salt and pepper and any desired seasoning. Place burgers on the grill and cook to your desired temperature. 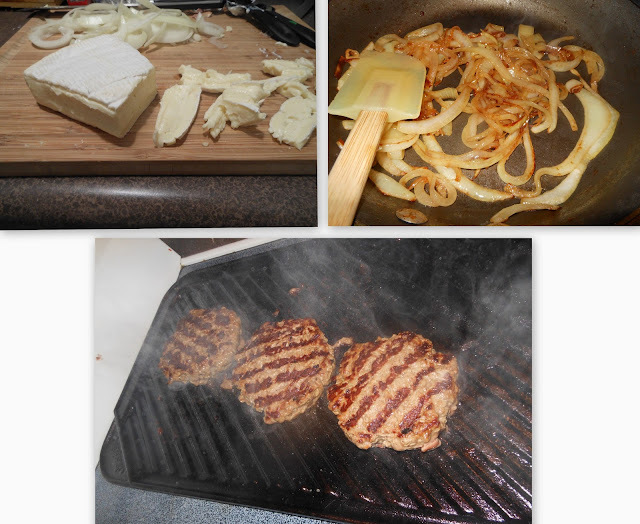 *While burgers are going, place onion slices, butter and brown sugar in a pan. Cook until caramelized. *Once burgers are finishing up, toast brioche buns under broiler for 1-2 minutes. Combine aioli ingredients. *Serve burgers with brie slices, aioli and caramelized onion. Enjoy hot! Grilling burgers! Check out all the smoke - good thing windows were open!